A funeral can and should be a fitting tribute for your loved one. At Macdonald & Weston we listen to your needs and guide you to take care of all the details and needs to ensure your loved one’s funeral service is personal, meaningful and everything you want it to be. We know the time after losing a loved one can often be confusing and challenging. Everyone deals with loss differently, emotions can be as varied as the individuals, and there is uncertainty especially when you are faced with planning your loved one’s funeral. It is important that everyone within your family is allowed to voice their ideas and opinions and be involved in their own way. We know the time after losing a loved one can often be confusing and challenging. The many families we have worked with have taught us the variety and scope of what is possible when the time comes to farewell a loved one. Families can and often do create their own distinct service or they can adapt or embrace traditional guidelines. Each person deserves a unique and individual service. Loss and its aftermath marks an important part of our lives and living with and moving through grief is an important step on life’s journey. The process of funeral planning can be stressful and daunting and it can be a challenging time when it comes to saying goodbye. At Macdonald & Weston our highly-experienced team are here to help you. We are committed to providing you and your loved one with excellent care and a unique, personalised farewell and a fitting tribute to their life. The team at Macdonald and Weston are committed to providing excellent service and assistance to the families we are serving. We know dealing with the loss of a loved one can often be a confusing time for some family members. Everyone deals with loss differently, even within a family group. Emotions can run high if the future is uncertain, while also being faced with the daunting task of planning the funeral. It is important that everyone within a family group can voice their ideas/options or be involved in some way with the farewell service. The celebration of life can be big or small and it can be formal or informal. We do not need to conform to someone’s expectation of the “perfect” funeral service. There is no standard funeral ritual. Each person has a unique service/memorial. It is an important day in our lives, and in our grief. The process of funeral planning can be stressful and daunting, it can be tough when it comes to saying goodbye, but with Macdonald and Weston it can be made easier. Give us a call to arrange a free, no obligation discussion or for information on 03 218 2156. For many people it is important to know how much a funeral will cost. There are many variables depending on the style of service families choose to have. The total cost of a funeral is dependent on a number of factors, some that we can control and others that we can’t. We will be able to guide you regarding costs and expenses. The variations in price mean that without sitting down and going through the specific requests it is hard to put a price on a funeral. We don’t want any hidden surprises. The Funeral Directors professional fee also covers all of the company overheads, vehicles, and on call staff – 24 hours, this fee can vary sometimes depending on our involvement in the funeral and services provided to the family. 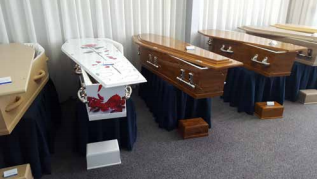 Caskets: We have a large selection of caskets available. 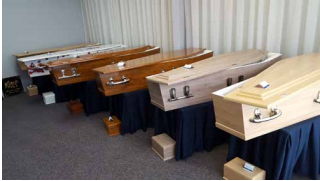 These range from a basic customwood casket at $800.00 to solid timber caskets in excess of $4000.00. Cost Saving Considerations: - Whilst we can and usually do look after paying all of the above for our families, there are ways of reducing the funeral expenses by families looking after some things themselves. Burial and Cremation Fees: These are charged from the local council. Your funeral director will be able to let you know these charges. Macdonald & Weston offers a full range of services to accommodate most budgets. Please ring us to discuss your specific requirements. We can advise on the range of assistance available for families requiring help with funeral costs. Assistance and advice can be given on the closing of bank accounts and applications for funeral grants from Work and Income and the Accident Compensation Corporation. WINZ Grant – there is a funeral grant available from Work and Income New Zealand. It is a lump sum payment to assist with funeral expenses, it is means tested and will not cover the full cost of the funeral. We can assist you with the application. ACC – if a person’s death is as a result of an accident an application can be made to ACC for a funeral grant. We can assist you with this application and usually do on your behalf. The casket - A wide range is available. The cost includes the casket, the linings, handles & other fittings, and labour for fitting these to the casket. Other items Other items (accounts paid on behalf of the family) - These cover as many items as the family wish to be charged to us, e.g. flowers, newspaper notices, cremation fee and church hire, celebrant, service sheets etc. It is our normal practice to forward the funeral account approximately 2 weeks following the funeral service. The account is due for payment approximately 30 days after the funeral invoice has been sent out. Professional Service Fee. These costs include, taking all details from the Family for documentation needed, along with booking times required for Cremation. It also includes all arranging of legal Documentation and release forms from the appropriate Authorities. Also covers resourcing and operating costs - Premises/vehicles/staffing 24/7. Customwood Casket. An customwood casket suitable for cremations. Mortuary Care. Washing and Sanitizing, Dressing of the deceased. Cremation Fees. All appropriate Fees paid by us. Professional Fees. These costs include, taking all details from the Family for documentation needed, along with booking times required for Cremation and a private service. It also includes all arranging of legal Documentation and release forms from the appropriate Authorities. Also covers resourcing and operating costs - Premises/vehicles/staffing 24/7. Casket. 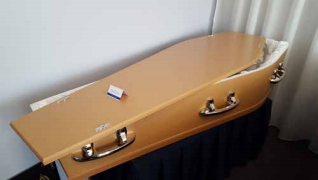 A Customwood, fully trimmed casket, six handles with satin lining, pillow, and all Standard fittings. Embalming Treatment. Embalming preparation including dressing of the deceased. We can also provide hair and makeup services. Newspaper Notice. One average sized Funeral Notice in the local Newspaper and Free Funeral notice on Macdonald & Weston Website. Doctors Fees. for Cremation Certificate. Death Certificate. extra copies available at a small extra cost. Viewings by appointment. One viewing, then one final viewing before farewell during office hours. Please be aware that appointments for viewings must be made and any after hour and weekend appointments will incur an extra cost. Professional Service Fee. These costs include taking all details from the Family for documentation needed, along with booking times required for Cremation and service to take place. It also includes all arranging of legal Documentation and release forms from the appropriate Authorities. Also covers resourcing and operating costs - Premises/vehicles/staffing 24/7. Customwood Casket. A fully trimmed casket, six Nickle handles with satin lining, pillow, and all Standard fittings. Embalming Treatment. Embalming preparation including dressing of the deceased or in some cases assisting the family to dress, we will also provide hair and makeup services. Newspaper Notice. One average sized Funeral Notice in the local Newspaper includes a Free Funeral notice on the Macdonald & Weston Website. Doctors Fees. for referral papers for Cremation. Viewings by appointment. Please be aware that appointments for viewings must be made and any after hour and weekend appointments will incur an extra cost. This is an example only of a funeral that includes all of the most common items in a funeral costing. Our burial packages are slighty different in that additional costs are for the actual plot fees. All plot costs include the plot, plot opening and life time maintenance. We have a wide variety of caskets and urns available to view in our showroom. We care about the enviroment and our impact, so our MDF caskets now have low fuming formaldehyde emissions which meet the new Japanese F**** standard which is the lowest emission standard in the world. We are also certified to meet the American CARB phase 2 standard for low formaldehyde emission board. They also carry the Environmental Choice New Zealand Certification and the New Zealand product range is certified FSC™ mixed source. When a death occurs overseas, we can arrange and coordinate transportation back to New Zealand. If your loved one dies in New Zealand, we can assist in returning them to their home country. This can range from transportation of the body and ensuring correct documentation accompanies your loved one’s ashes. We are able to liaise with embassies, consulates, airline and government agencies on your behalf to ensure a dignified repatriation service is adhered to.